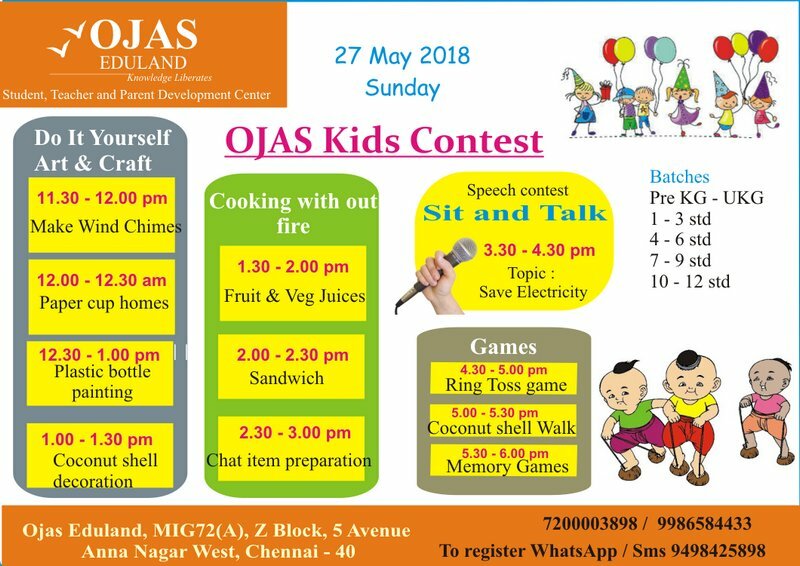 We are organizing a Kid’s competition on 27 May 2018, Sunday. Age Group: 3 – 18 yrs (Play school to 12th std ). All the age group can participate in all the items. 1. Do It Yourself – Make wind chimes using reusable items. Participants have to bring materials and prepare wind chimes using reusable items like water bottle, Driftwood Pieces, Jute, coconut shells, waste keys, Beading Thread, Old CDs, paper cups, old beads, ice cream sticks etc. Participants have to bring reusable paper cups and make group of homes; miniature village. Participants have to bring reusable paper bottle and paint on it. Participants have to bring coconut shell and may decorate it using paints, stickers, beads, etc. Participants have to bring chat items like pani poori, puffed rice, onion, etc., for preparing chat items. Participants have to sit and speak for maximum 3 minutes. Ring Toss is a game where rings are tossed around a peg. Rings will be given to the participants. Participants have to bring 2 coconut shells tied on the single rope. Kids have to walk on the toes holding a coconut shell. Some objects will be placed on a table. Participants will be given a few minutes to memorise those objects. Then the participants will be asked to recollect it. Registration fee Rs.200/- for a participant per event (for all the age group).